Learn how to set limits for Semalt bots that are visiting your website. Go to the page Semalt Crawler to find the detailed information on the search bots technology we apply for statistics monitoring. Go to the page Semalt Crawler and read the information about crawlers. Remove the site from our seed list: enter your website URL in the field at the lower part of the page. You can enter several URLs – each in a new line – to speed up the process. If your website contains subdomains, you must add them to the list as well. Be attentive! URL http:/www.domain.com/ and http:/domain.com/ are two different web addresses! Click the button Remove under the URL field. The changes will be applied within 30 minutes and Semalt search bots will never visit your websites again. Check your website statistics the next day after you used Semalt Crawler to make sure you performed all the tasks properly. I have added all my websites to Semalt Crawler but the robots are still visiting my pages. You probably failed to enter all the subdomains or the changes have not been applied yet. When I add my website to Semalt Crawler, will it be removed from the Semalt database once and for all? Yes, the website will be completely eliminated from the list of web resources we visit. 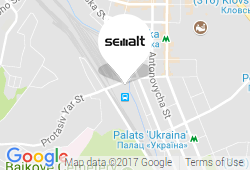 Please feel free to contact our support service if you have any questions about Semalt Crawler.